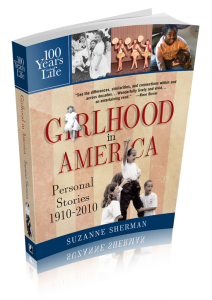 Girlhood in America: Personal Stories 1910-2010 - Available now! In 1911 Florence takes a ride in a Model T her dad buys from a door-to-door car salesman. Julia climbs trees in the 1920s dressed in a skirt and bloomers. Linnie makes flour “bombs” on Halloween in 1943. Johnny is bussed across town to a “white” school in Little Rock, Arkansas in the 1960s and in New York Victoria goes to Woodstock as a twelve-year-old. Nothing could be more fun for one Gen X-er than shopping at the mall with her “weekend dad,” in the 1980s. These are a few of the stories that bring a stunning century to life like you’ve never seen before. In this remarkable collection of first-person stories from every decade between 1910 and 2010, over fifty girls under thirteen years old give an eye-opening look at life. The girls are from every region of the United States, from Maine to Molokai’i. Born between 1907 and 2001, their stories are an entertaining look at history, colored by the power of the personal. A short history of each decade introduces the ten chapters, giving context for the stories inside. “What Else Is New?” offers a quick look at pop culture highlights from every decade. Some are fun to remember, others are hard to imagine. You’ll read about each decade’s newest games and candies, social codes and styles, radio shows and movie idols, favorite books and singers, player pianos and MP3 players, video games and virtual entertainment. It’s a century of fads and fantasies, challenges and longings, privileges and prejudices, devotions and discoveries, bravery and daring. Girlhood in America reveals the extraordinary in the ordinary in the 20th century and beyond. Find out what influenced a part of the population tuned in to the pulse of culture.